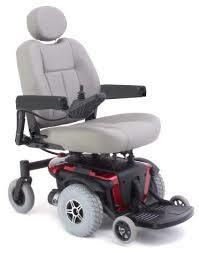 This powerchair was bought and used for one of our students with mobility problems. The student has now left and we have no use for the machine now. The powerchair was bought 2 years ago by the school. It has just had a full service by “Assured Mobility” in Bath. 2 brand new batteries. This chair will also come with the charger and a as new bag for the back of the chair. This Jazzy 1103 Ultra Power Chair features a 20 x 20 inch Deluxe High Back Seat, Built in Battery Charger, Flip Up Foot Plate, VSI Joystick, 10 inch Solid Drive Tires, 5 inch Electric Seat Lift, and has a Battery Range up to 15 Miles! The Jazzy 1103 Ultra brings sporty style and high performance features, like a standard power elevating seat and Active-Trac Suspension, together into one perfectly balanced power chair. With a 18 inch Turning Radius the Jazzy 1103 Ultra is highly compact and maneuverable, perfect for navigating around the home. The Jazzy 1103 Ultra sports a low center of gravity design delivering a very smooth and stable ride. 10 inch knobby drive wheels and optimum weight distribution provide superior traction, perfect for getting around outdoors! If you’re looking for a Power Chair that performs great in any environment the Jazzy 1103 Ultra is a perfect choice!